American Commercial Barge Lines headquarters near the Ohio River in Jeffersonville, IN. Consider this your invitation to join us on Tuesday, November 21 from 12:00 AM to 1:00 PM, the Carnegie Center for Art and History will host its monthly Lunch and Learn program. Presenting will be Ken Groth and Captain Mark Dougherty from the American Commercial Barge Line. Their presentation will touch upon the many realities and challenges involved in operating a large commercial business on the Ohio River. Lunch and Learn is a free to the public program, however, registering to attend is appreciated and easy to do. Please email Delesha Thomas at dthomas@carnegiecenter.org or call the Carnegie Center at (812) 944-7336 so we can save you a seat. ACBL Towboat, the “Leo G. Lutgring”. Begun in 1915 as a coal carrier based out of Kentucky, American Commercial Barge Lines (ACBL) has invested and grown into one of Southern Indiana and Louisville’s most significant and historic businesses. Headquartered in Jeffersonville, IN, ACBL employs approximately 3,700 people throughout its company and their Jeffboat division is one of our nation’s largest and oldest continuously operated inland shipbuilders. During WWII, Jeffboat helped to design and manufacture the “Landing Ship, Tanks” or better known as the “LSTs” which were boats used to move troops and equipment and played a big role during the Invasion of Normandy in 1944. 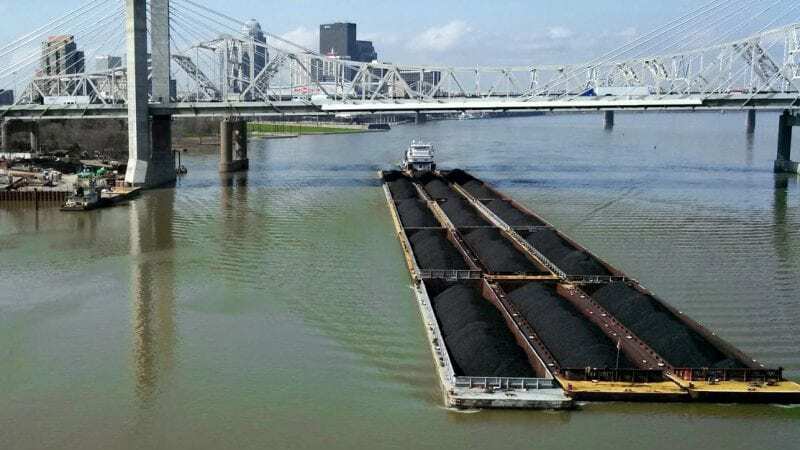 Coal barges near Louisville, Kentucky. As in our nation’s earliest days, rivers remain important and economical highways to move goods. During 2016, about 236 million tons of goods were moved by carriers on the Ohio River alone. The nation-wide ACBL fleet numbers approximately 4,200 barges powered by 175 towboats. To help visualize how much cargo is involved, imagine that the standard commercial barge is 195 feet long and 35 feet wide. One barge can equal the goods being carried by 70 semi-trailer trucks! Or, in another interesting visual, one barge of wheat can equal one million loaves of bread!! 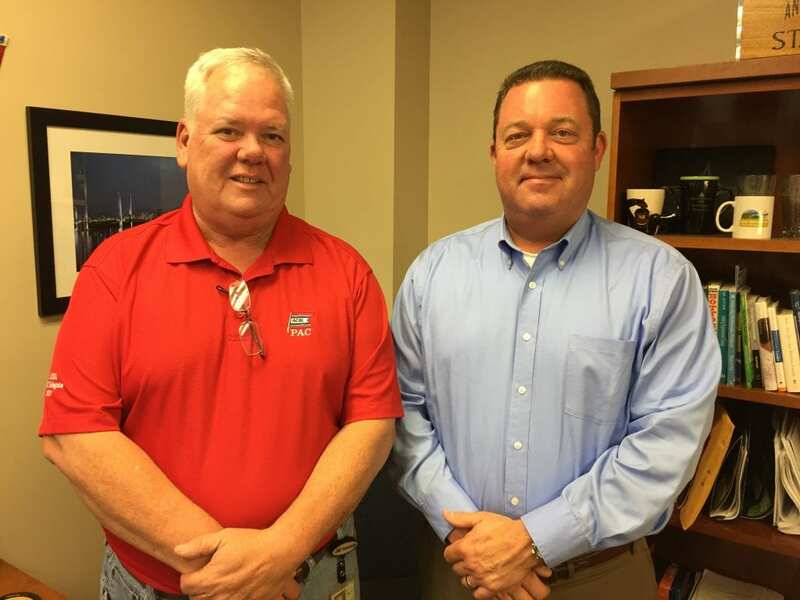 Captain Mark Dougherty and Ken Groth from American Commercial Barge Lines. Our presenters for this edition of Lunch and Learn are Ken Groth, Director of Organization Development for ACBL and retired Captain Mark Dougherty, who is their Manager of Training at ACBL. Each brings an informed perspective about life on the river that is sure to be new information for many Lunch and Learn attendees. For the purposes of this talk, Groth and Dougherty will focus on the recent history and challenges to American Commercial Barge Lines since the Second World War. As in past presentations, if guests bring a lunch, the Carnegie Center will supply beverages. We hope to see many of you on Tuesday, November 21 at noon for what promises to be a very interesting topic.